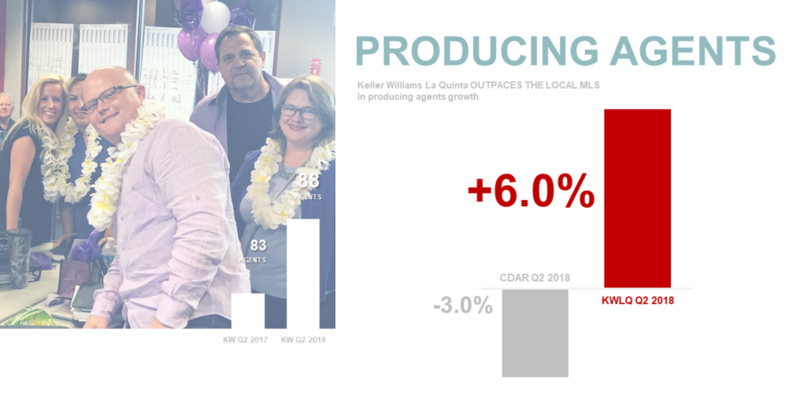 Keller Williams La Quinta Market center located in La Quinta, California experienced rapid growth in Transactions during Q2 ’18. Keller Williams La Quinta shattered its previous productions records in Total Listings Sold, Contracts Written, Total Closed Sales. Leading indicators point to a strong Q2 ‘18. Closed transactions total 175 units, up 13 percent over Q2 ‘17 and OUTPACES THE LOCAL MLS. Total Listings Sold is 105 units, up 11 percent over Q2 ‘17 and OUTPACES THE LOCAL MLS. Contract Written is 93 units, up 2 percent over Q2 ‘17 and OUTPACES THE LOCAL MLS. 88 agents produced sales, up 29 percent over Q2 ’17 and OUTPACES THE LOCAL MLS. Keller Williams agents around world also aren’t just shattering internal records, they are rattling the industry and leading performance lists. Keller Williams is now home to 163,999 agents in the United States. Keller Williams’ agent count INCREASED 10.7% and OUTPACES THE INDUSTRY. Keller Williams agents closed 310,476 transactions this quarter, up 4.4 PERCENT over Q2 2017. Keller Williams OUTPACES THE INDUSTRY in transaction growth. KW agents closed a record-setting $95.8 BILLION in sales volume, up 9.4 PERCENT from Q2 2017. Keller Williams OUTPACES THE INDUSTRY in closed sales volume growth. Profit share increased 1.4 PERCENT over Q2 2017, with associates cashing checks worth $60.3 MILLION. “We had more agents involved in transaction than the last year at our market center. That indicates we’re getting into business with the best people. We’re taking advantage of the best training in the world. And, we’re using our new KW Technology to leverage our time and talents.” said Mark. About Keller Williams: Austin, Texas-based Keller Williams, the world’s largest real estate franchise by agent count, has more than 950 offices and 181,000 associates. The franchise is No. 1 in units and sales volume in the United States. In 2018, Training magazine inducted Keller Williams into its Hall of Fame of top training organizations across all industries in the world. Since 1983, Keller Williams has grown exponentially and continues to cultivate an agent-centric, education-based, technology-driven culture that rewards agents as stakeholders. The company also provides specialized agents in luxury homes, commercial, and land properties.